Opticae fibrae rudentes ad lucem inter nodos reticuli transmittendam adhibentur. Interretis tabula geographica die 15 Ianuarii 2005 apud opte.org per partes monstrata. Reticulum computatrale sive reticulum datorum est digitale reticulum telecommunicationum, quod sinit ut nodi opes inter se partiant. In reticulis computatralibus, artificia computandi data inter se permutant per coniunctiones (nexus datorum) inter nodos. Qui nexus datorum constituuntur per rudentes reticulorum sicut fila ferrea vel rudentes opticos, vel media sine filibus ferreis sicut Wi-Fi. Bertsekas, Dimitri, et Robert Gahhager. 1992. Data Networks. Prentice Hall. Kurose, James F., et Keith W. Ross. 2005. 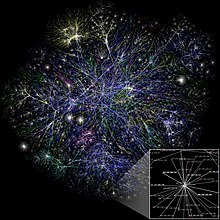 Computer Networking: A Top-Down Approach Featuring the Internet. Pearson Education. Shelly, Gary, et al. 2003. Discovering Computers. Stallings, William. 2004. 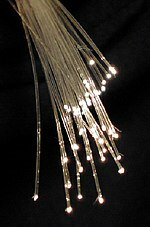 Computer Networking with Internet Protocols and Technology. Pearson Education. A computer networking acronym guide. Novissima mutatio die 15 Decembris 2018 hora 17:35 facta.